Apologies for the long silence. It’s actually because we’ve been really busy and things have happened so fast that I couldn’t begin to get them written up as a blog. Excuses over lets get started. Here’s another selection of interesting things that people have done with our fabric. Most of these are from Japan and unavailable from in the UK, but if do you see something you’d really love to have, send me a comment or a direct message and I’ll do the best to help. These classic Herman Miller chairs originally designed by Charles Eames have been upholstered in our black/white roundcross fabric and I think they look fantastic. As well as vintage chairs people have been using our upholstery cloth for modern designs. 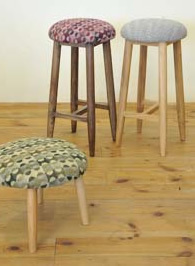 See these stools from SuSu a small company in Japan. And finally some brilliant cushions from a company called Takaokaya again in Japan They take the fabric and use it in a totally original way, almost like Origami.